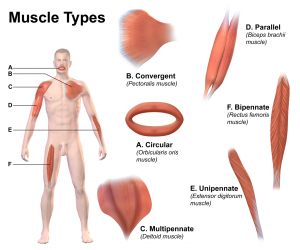 The muscular system allows the body to move voluntarily, but it also controls involuntary movements of other organ systems such as heartbeat in the circulatory system and peristaltic waves in the digestive system. It consists of over six hundred skeletal muscles, as well as the heart muscle, the smooth muscles that surround your entire alimentary canal, and all your arterial blood vessels (see Figure 2.24 “The Muscular System in the Human Body”). Muscle contraction relies on energy delivery to the muscle. Each movement uses up cellular energy, and without an adequate energy supply, muscle function suffers. Muscle, like the liver, can store the energy from glucose in the large polymeric molecule glycogen. But unlike the liver, muscles use up all of their own stored energy and do not export it to other organs in the body. Muscle is not as susceptible to low levels of blood glucose as the brain because it will readily use alternate fuels such as fatty acids and protein to produce cellular energy. The Muscular System by University of Hawai’i at Mānoa Food Science and Human Nutrition Program is licensed under a Creative Commons Attribution-NonCommercial-ShareAlike 4.0 International License, except where otherwise noted.